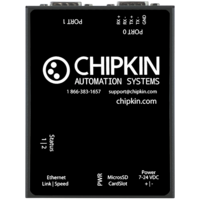 Chipkin Automation Systems Inc. is proud to announce a much-anticipated product release. We have developed a custom driver for the XProtect CCTV system which allows a building control system to have control over relays, groups, and be able to drive selected cameras to presets automatically. Vancouver, BC, Canada - February 21, 2018 - Chipkin has developed a custom driver for the Xprotect CCTV System. This allows any remote system to send event / command strings to the Xprotect system to drive the system to a particular state. For example, it can allow a building control system to drive a particular camera to a preset location and focus. The general purpose gateway for Xprotect was originally developed for a project where automation was controlled by a PLC system that uses Modbus TCP. Thus, the project allowed the PLC to drive selected cameras to have control over relays, groups, and be able to drive selected cameras to presets automatically. Established in 2000, Chipkin Automation Systems Inc. is a specialist engineering consultancy providing services that are currently focused on system integration and protocol conversion.